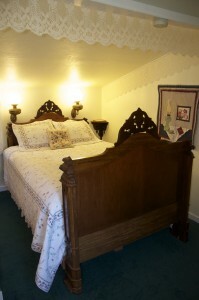 Meadow Creek Ranch guest rooms are elegantly decorated with antiques including a high, old fashioned, carved, queen size bed, The rooms have air conditioning, private bath, sitting area, and refreshment tray. 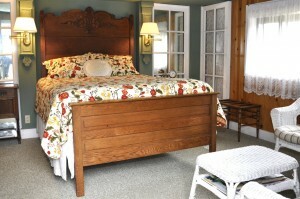 Guests may choose to enjoy the company of international guests, Meadow Creek Ranch innkeepers, Willie and Diana Wilcoxen, and their purring cats in the Main House living room or library. Gather in the dining room for our family-style breakfasts, all fresh and home-made. Our gourmet coffee by Mariposa Coffee Company is freshly roasted and ground. Wi-Fi DSL internet access is available in the main house and the Garden Gate Room. Wi-Fi DSL internet access is not available in the Country Cottage. Feel free to wander the park-like grounds on seven acres. Dip your toes in the seasonal creek, admire the meadow views, trees and wildlife from the front porch, or just doze in the hammock.